Upland hill farming is a specialised profession, which takes careful management to ensure a productive, sustainable farm. Management techniques have changed slowly over centuries, this low intensity traditional management is particularly valuable for wildlife and the natural environment. Our Upland Farming Blog gives an insight into a year on an upland farm. 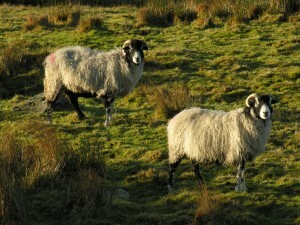 Upper Nidderdale is a traditional sheep and cattle breeding area, with all farms running a hill sheep flock which are mostly Swaledales, with some Lonk and Dalesbred sheep as well. These breeds are locally adapted to the terrain and climate and are a key part to the national sheep farming system producing the lowland Mule sheep which in turn, produces the vast majority of lamb meat consumed in the United Kingdom. Carbon sequestration and improved water quality. Upland hill farming has been significantly supported by EU and government schemes which have enabled many farm businesses to break even. The support payments have in part ensured that traditional management practices are retained, that might otherwise have been lost. 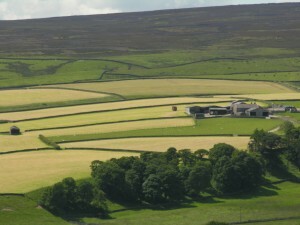 The Landscape Partnership Scheme is helping farmers to increase their farm business profitability through the Whole Farm Plans project, while our Wildflower Nidderdale and Upland Birds projects will help farmers look after habitats on their land.